Than Tho – not only a source of inspiration for many poets, writers but also a Da Lat’s famous beauty spot. 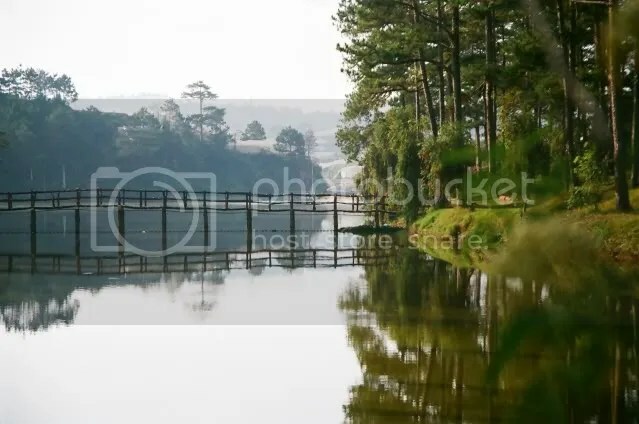 Whenever go to Da Lat, tourists want to go to visit Than Tho lake – a beautiful place related to many legends about uncompleted love. Than Tho is located about 6km to the east, along the Quang Trung – Ho Xuan Huong. This is a nature lake in a silent hill. Long ago, there was a small pond in this area that had been called Torô Pang Dong. Later, the French blocked water into another and named Las des Suopirs. This name has the second meaning which is “whisper”. In the morning, fog covers the water surface and creates such a beautiful water-colour-painting. That’s why this lake also has another name is Suong Mai (that means fog in the morning). Therefore, you can call it ” Than Tho’‘ or ” Suong Mai“. However, the name “ Suong Mai” is not famous as “Than Tho”. Visiting Than Tho, visitors have chance to walk on green lawn, see the pines reflecting itself into the lake. Or, visitors can join horseback racing service to go around the lake to find the inspiration of nomads. After visiting, visitors can stay in cabanas along green lawn to see orchids and listen a romantic but sad love. Once coming to Than Tho lake, you are going to hear many unhappy love-stories. So this will be an interesting point for curious visitors. This is place where a couple has drowned themselves in order to live together after death. And pines here sways and makes some sound like mourning for them. As the story goes, long time ago there lived a young couple in this area. They loved each other very much and often met each other near the lake. At about the time when they spoke of building a future together, Vietnam was in the state of war with foreign invaders from the north. There was a general call for able-body young men to take arms. The young man, Hoang Tung, being extremely patriotic, decided to join the army of king Quang Trung – Nguyen Hue to help defend Vietnam. The young couple decided to meet by the lake to say goodbye as Hoang Tung was leaving with his garrison for the north. His betrothed Mai Nuong, being equally patriotic, decided not to be a burden in his mind, lest he won’t be able to perform his duties, decided to commit suicide by drowning in the lake. When the time came for the two to meet, Hoang Tung found that she has passed away. The people in this region heard of the young couple’s story and decided to rename the lake Ho Than Tho or Lake of Sorrow. Several variations of the story are published. One version along this line claimed that Hoang Tung did not show up at the appointed time. Mai Nuong was heart broken and spent many days by the lake to wait for him. Hopeless, Mai Nuong committed suicide by jumping into the lake. Since then, Than Tho lake called to this day. This entry was posted in Uncategorized and tagged Than Tho Lake by vietnambeautiful. Bookmark the permalink.